Looking for Pallet Racking Solutions in Sheffield? Over the years we have worked upon many projects for customers based across the Sheffield and South Yorkshire region. The city of Sheffield has long been famous for heavy engineering in particular the manufacture of Stainless Steel, it was also at the heart of the old South Yorkshire Coal mining industry and whilst the regional mix of industry may have changed over time Sheffield’s central location ensures that it will always be an important manufacturing and distribution hub with excellent road, rail and air links. 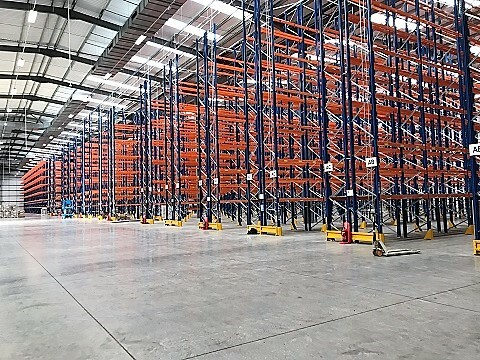 You may be looking to develop new facilities or simply looking to expand the capacity you have at your existing premises in the Sheffield or the South Yorkshire region and are looking for bespoke industrial storage solutions such as pallet racking, push back pallet racking, double deep pallet racking, narrow aisle pallet racking, drive in or external pallet racking then we think you have landed on the right website. We completely understand that each business is unique, which is why all of our services are bespoke in nature enabling us to provide you with the ideal solution whatever your requirements, just fill out the enquiry form and a member of staff will be in touch or better still call a member of the team on 01423 819 057 for an initial no obligation discussion. Well we are a long established supplier and our team has extensive industry knowledge. Furthermore we are proud to have worked with some of the biggest and best known companies around. We pride ourselves in delivering cost effective pallet racking solutions to customers in the Sheffield and wider Yorkshire region. We are a Yorkshire based business, so always close at hand and we understand that our customers what are looking for, namely quality, service & value. The key is to making the best possible use of the workable space that you have, in many cases the costs of improving your existing premises would be considered small when compared to building extensions or relocation. However it is not just pallet racking we offer, we also offer an comprehensive range of shelving options as well as having the capacity to design and build Mezzanine Flooring solutions, so if you are based anywhere in the Sheffield or South Yorkshire region & are looking to find a trusted and professional supplier of pallet racking or storage solutions then please feel to call a member of the team today on 01423 819 057.